Banana bread needs no introduction, it is a quick and easy bread that is good to eat just about anytime. Zachary eats at least a banana a day, if not more, so this recipe was not a tough sell. The only difficult part was saving three bananas so they could reach the requisite level of ripeness (i.e., over-ripeness). As with many of the "cooking with kids" recipes I have posted, it follows the familiar formula of combining dry ingredients and wet ingredients separately, and then stirring them all together. This recipe is a version of one found in The Best Recipe Cookbook, an essential standard cookbook, published by the good folks at Cook's Illustrated magazine - also essential, in my opinion. Preheat oven to 350. You can bake this in a bread pan, if you have one, or in an 8x8 cake pan. I opted for the cake pan, the only difference is baking time. So go ahead and grease whichever pan you are using. The most fun part of the recipe, is, of course, mashing the bananas - mash them good! Then add the yogurt, eggs, butter and vanilla and stir to combine. Whisk together all dry ingredients, including walnuts (we omitted the nuts in our recipe because Zachary generally objects to finding crunchy bits in his food). Finally, add the dry ingredients to the wet ingredients. The trick is here is to fold them in gently with a spatula, and just to the point at which they are combined (i.e. there is no "raw" flour apparent in the mixture). The reason is, the more you stir, the more gluten develops and too much gluten will result in your bread being small and tough. That being said, this may be a good task for the parent to handle, if the child is a potentially vigorous stirrer. Finally, scrape the batter into the greased pan and put it in the oven. If using a breadpan, the cooking time is about 55 minutes but I would suggest testing it at 40-45 minutes just to be sure. The cake pan time is a lot less, try testing at 30 minutes. For the baking impaired, testing means removing the bread and sticking a cake tester into the middle - if it comes out clean, your bread is done. If it comes out with batter on it, put the bread back in for several more minutes and then test again until you get it right. Once you are satisfied, let it cool in the pan for 5 minutes, then remove to a wire rack. 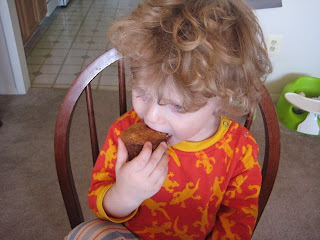 As the picture illustrates, this bread was extremely popular with Zachary. After spending some time in the fridge, a slice will benefit from a few brief seconds in the microwave to warm it up - or alternatively, you can toast it. Once you have a made it a few times, you could try modifying the recipe - add a 4th banana, for example, or add some chocolate or cocoa powder to the batter. Zachary is so adorable and looks like a natural in the kitchen. 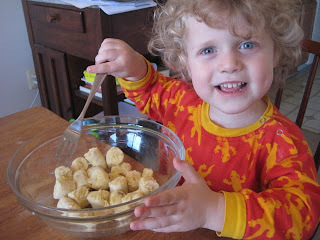 :) My nephew loves bananas (he is 4), so I am going to make this with him. He enjoys the kitchen, too! Thanks for sharing this!